Hyoho (meaning strategy also spelt Heiho) Niten Ichi Ryū is a form of Kenjutsu (剣術) meaning "the method, or technique, of the sword." This is opposed to kendo, which means "the way of the sword". Kenjutsu is a catch-all term for all (koryū) schools of Japanese swordsmanship, particularly those that predate the Meiji Restoration (1868). In this way kenjutsu is very much associated with the genuine battlefield techniques used by the samurai during combat in feudal Japan. Niten Ichi ryū is unique among kenjutsu styles as it focuses on the one handed use of the sword, be it the long sword (daitō) or short sword (kodachi). Musashi felt that there was limited flexibility and fluidity of movement when both hands are used on a single sword. In his writings Musashi indicates that a sword was held in both hands is not easy to wield freely to either side, nor is it ideal for use when mounted on horseback. Thus at roughly the age of 21 (1604-1605), he started developing a two sword style of combat, allowing the swordsman to wield one sword in each hand fluidly. 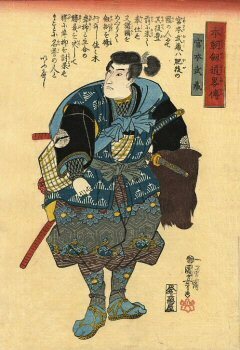 He had already established himself as an excellent swordsman in various duels and battles (Kihei, Akiyama, Genzaemon, Sekigahara etc). However he did not use it in public combat until he was 30-31 between 1614 and 1615, after the Winter and Summer battles of the Osaka campaign during a duel against Miyake Gunbei. Musashi fought over 66 duels and won them all and he founded a number of schools of swordsmanship culminating in the Niten Ichi Ryū. Musashi's Niten technique was counter intuitive to the traditions of most swordsmen of the time as the majority of schools were based on gripping the katana with both hands. In addition Musashi’s technique was highly sophisticated and refined, focused on efficient movement and power. To achieve this the style has no flashy, excessive or unwanted movements. Instead it focuses on developing subtle timing and distance removing the swordsman from immediate danger while simultaneous creating an opening to strike the opponent. Learn more about Musashi's kenjutsu style, Hyoho Niten Ichi Ryu here.